Live Learn Shine On: Kylie To Perform In Abu Dhabi! 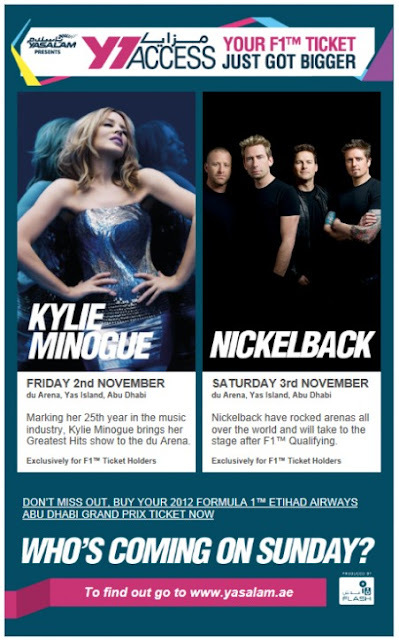 Kylie will perform on the first night of the Yasalam After-Race Concerts (Friday 2nd November), Now in their fourth year, the Yasalam After-Race concerts are staged at the du Arena, Yas Island, exclusively for F1 (tm) ticket holders. Yasalam is one of the most hotly anticipated festivals on the UAE’s entertainment calendar, returning to the city for a fourth year. This year it offers even more privileges for F1(tm) ticket holders through the newY1 Access.